Brown algae is the largest type of algae. They are brown or yellow-brown in colour and are usually found in temperate or arctic waters. Brown algae usually have a holdfast. There are between 1,500 and 2,000 species of Brown Algae. 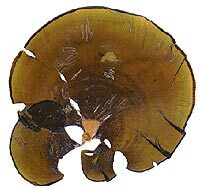 They contain an extra pigment (fucoxanthin), which often masks the green chlorophyll shared by all algae. Their colour ranges from an olive green to various shades of brown. The particular shade depends upon the amount of fucoxanthin present in the alga. All brown algae are multicellular. The brown algae include the largest and fastest growing of seaweeds. The stipes of giant kelp can grow up to 6 centimetres in a day. 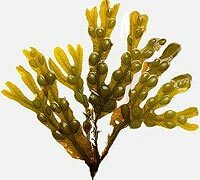 The cell wall of brown algae consists of two layers; the inner layer provides strength and is composed of cellulose; the outer wall layer is mainly algin, a jelly-like material when wet but it becomes hard and brittle when it dries out. Compounds made from algin are used as thickening, stabilizing, emulsifying, or suspending agents in industrial, pharmaceutical, and in foods, such as ice cream. Brown algae grow in a wide range of sizes and forms. The smallest members of the group grow as tiny, feathery tufts of threadlike cells no more than a few centimetres long. 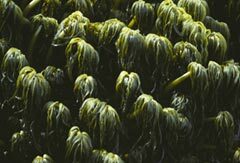 Kelps can range in size from the two-foot-tall sea palm Postelsia to the giant kelp Macrocystis pyrifera, the largest of all the algae. In form, the brown algae range from small crusts or cushions to leafy free-floating mats formed by species of Sargassum, which creates unique habitats in the tropical waters of the Sargasso Sea, in the middle of the North Atlantic Ocean. 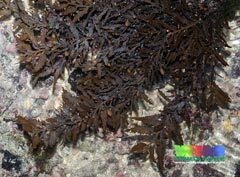 Brown algae may consist of delicate felt-like strands of cells, as in Ectocarpus, or of foot-long flattened branches resembling a fan, as in Padina. Many brown algae, such as the Fucales, usually grow along rocky seashores.